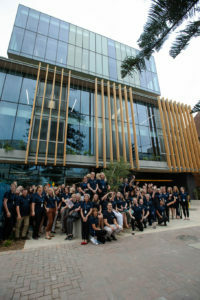 On Monday December 17, 2018 we officially launched our state-of-the-art Centre for Country Kids facility at a special celebration attended by the Deputy Prime Minister of Australia, The Honourable Michael McCormack MP; NSW Premier, The Honourable Gladys Berejiklian MP; and NSW Governor, His Excellency General, The Honourable David Hurley AC DSC (Ret’d). Ushering in a new era for our 94-year-old charity, our Centre for Country Kids (CCK) stands tall as Australia’s only integrated health, education and disability service dedicated to improving the health and wellbeing of country children. Positioned to support thousands more children with developmental challenges and their families across regional Australia, the Centre will also advance our goal of ensuring every country child can access the same level of health and wellbeing services as city children. Funded in conjunction with the NSW Government and Commonwealth Government, and marking the culmination of more than a decade of planning and building, CCK will help to ensure health services for country kids are more equitable and effective. Specifically, it will support the expansion of our globally-recognised, awarding-winning Telecare for Kids program, as well as dramatically improving the experience for clients with complex needs who attend our Paediatric Developmental Program in Manly. Deputy Prime Minister and Nationals Leader Michael McCormack said the Federal Government’s $10 million investment ensures rural and regional children can get the access to health and educational support services they deserve. 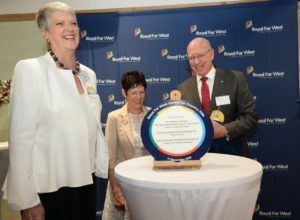 “For generations, Royal Far West at Manly has held a special place in the hearts of country families when it comes to making sure distance is no barrier to accessing integrated health, education and mental support, Mr McCormack said. Our CEO Lindsay Cane says, “We’re incredibly grateful for the funding that came from the NSW and Federal Governments, as well as from our corporate supporters and the public. Without their support, we wouldn’t be opening the doors on this beautiful new facility which promises to enhance and expand the depth of our help to vulnerable children in Australia who have long been falling between the cracks. This cutting-edge facility will bring us closer to meeting the ever-growing needs of country kids and communities across the nation”. We expect to triple the number of children and families we help each year, to 15,000 by 2020, and increase our charity’s impact on rural and remote communities doing it tough in the face of severe drought conditions. The six-storey Centre is an integrated facility where clinicians, teachers, our therapeutic recreation team and parents will work side-by-side to treat and support country children. It features 25 clinic rooms, including a dedicated Paediatric Occupational Therapy Room. In total, CCK will house more than 150 staff including speech therapists, occupational therapists, psychologists, psychiatrists, nurses and dentists, business and corporate services teams. The facility doubles the number of Telecare Pods. 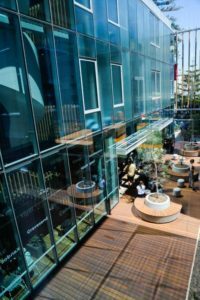 It also includes three large classrooms or six smaller ones with its flexible design, as well as breakout rooms designed to help children transition between school and appointments, open space and recreational play space. The Oral Health Unit for dentistry and orthodontics was made possible through a generous donation from the Sargents Charitable Foundation, and the Telecare services will be powered by global technology partners HP and Cisco. The CCK is enveloped by a striking 37-metre custom-made Aboriginal art fence. The two works on the fence are titled “Healing Connections – Coast to Country” and “Wirnpa – Back to Country”, and bring to life a story of healing and connections: between country, coast, waters, lands and skies.